Morgan James Publishing, 9781683504160, 244pp. What fears and limiting beliefs keep you from achieving the life you want? Everyone suﬀers inaction from limiting beliefs: "I can't possibly do that" or "I don't have enough (money, time, ability) to do that." Unlimiting Your Beliefs is the key to conquering those negative voices you're holding onto. Karen Brown, business psychology coach, speaker and ultra-athlete, shares proven strategies to transform your limiting beliefs and achieve any goal or dream. After struggling with her own limiting beliefs and fears, Karen discovered her true potential by finishing the most difficult race in the world, the IRONMAN World Championship, accomplishing a goal she'd held for 28 years. 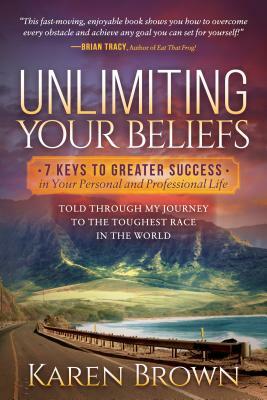 Unlimiting Your Beliefs is a success manual that puts the 7 powerful keys to achievement right at your fingertips so you can make any dream possible for yourself. You already possess the power to achieve anything you desire; unlimit your beliefs to tap into it. Karen Brown realized her potential and the keys to achieving greater success in her personal and professional life when she pursued and achieved a 28-year dream of competing in the toughest race in the world, the Ironman World Championships. 90,000 athletes vie annually for 2,000 coveted slots to compete in this race, which is mostly professional athletes and podium finishers in each age group. Karen was neither of these, nor a triathlete when she decided to pursue this audacious dream. For this reason, the story and the keys are relatable to everyone wanting to achieve higher success. Karen's credentials include: International coaching certification, Master Practitioner, Certified Keynote Speaker, 20 years' business psychology coaching experience. She has been featured in Forks over Knives, The Denver Post, Columbine Courier, Littleton Independent, and Penticton Herald. Karen has written for Terra Firma and was a contributor to the book Walking Your Life. She resides in Littleton, Colorado.